On each side of the famous Washington Square Arch stands George Washington in two distinct poses at its pedestal: Washington At War on the East side and Washington At Peace on the West. The Arch was designed by noted period architect Stanford White (1853-1906). Originally built in wood for the Centennial of Washington’s inauguration in 1889, it stood half a block away. It was then commissioned in marble and completed in its current location in the early 1890’s. Of the Washington At War statue, Emily Kies Folpe, in her book, “It Happened on Washington Square,” wrote that the sculptor, Herman A. Mac Neil, wanted the statue “to appear alert and intent, as if watching the maneuvers of his army.” Looking on are the figures of Fame and Valor. Exitus acta probat is taken from the George Washington Family Coat of Arms. It is Latin and I’ve come across various ways of interpreting it, all similar but slight variations. The basic translation is: the outcome justifies the deed. It’s the pairing of that statement with the figure of Justice that puzzles me. I like to think at Washington Square Park that ultimately there will be some kind of ‘Justice’ in the outcome of the redesign of the Park. Is there some missing deed? Of course, Stanford White’s “outcome” was a little bit jarring. He was shot on the roof of the Madison Square Garden building, the second incarnation of the building (no longer there) which he also designed, by the husband of an ex-lover. The outcome justifying the deed that Washington was referring to was the Revolutionary war. No one wanted war then, not only was it near suicide for all who opposed the English, but also, war causes a lot of death which is also something that he didn’t want, however, if the end result was freedom and liberty, then a horrible deed such as war is in fact justified. It shows that Washington believed that unless the outcome is justified, then the deed should not be done. Piece originally published April 3, 2008; this is an edited version. Washington Square Arch Rocks at 123 Years! 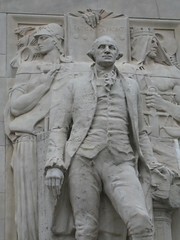 The statue of “Washington in Peace” that is on the west side of the Washington arch was carved by Alexander Sterling Calder, the father of the inventor of the Mobile, also named Alexander Calder. Hi Marc, thanks for your comment. That is mentioned in this piece but his name is not written out in full, so thank you for that. And I did not know about the father. I also did not know what a mobile was (https://en.wikipedia.org/wiki/Alexander_Calder). Learned something new. Look up George Washington’s coat of arms. In his family crest are the words “exitus acta probat”. Actually, that information is within this post! Perhaps you missed it. It is in the fifth paragraph. Thanks for checking out the blog and your interest! I kind of interpreted as the consequences are because of the actions. But if there is good reasoning behind the action then it is justifiable or validated.